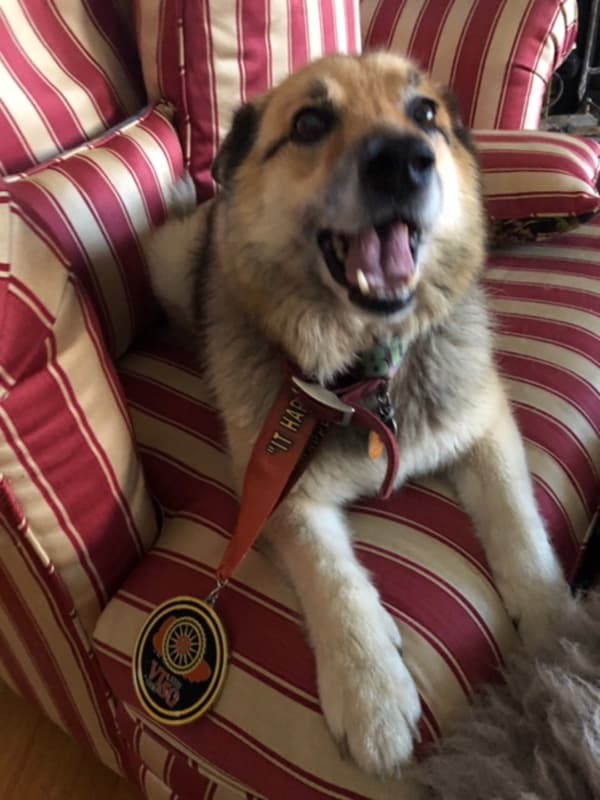 Kiki, an 11 year-old Icelandic Shepherd, was the only canine to receive a medal in the Vermont 50—the annual 50 -mile bike and running race held Sept. 30 in West Windsor. of the 179 runners in the Vermont 50 went by. The temptation was too much. Kiki, an 11 year-old Icelandic Shepherd, started running the 50-mile bike and running race Sept. 30 with hundreds of other people in the race. When Kiki crossed the finish line, the officials awarded him a medal. Unlike Rosie Ruiz, the infamous record-setting 1982 Boston Marathon runner who was stripped of her win when it was revealed she jumped into the race just a half mile from the finish, this dog will be allowed to keep his prize. Corke, returning from running errands, discovered Kiki, was missing, and with Kola, his other Icelandic shepherd, by his side, drove his pickup all over their property, and up and down local dirt roads. The frantic dog owner sent emails and posted notices on the internet regarding his lost dog. Friend and neighbor Ralph Stone appeared at the door, announcing that Kiki was at Mt. Ascutney, eight miles away, at the Vermont 50 finish line. The adventurous pooch had partnered with one of the runners and the duo finished the race together. Stone drove Corke to the finish line at Mt. Ascutney Lodge, where Kiki was found sitting in the car of one of the race volunteers.